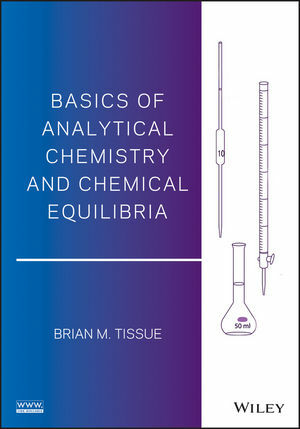 Designed to be completed in one semester, this text enables students to fully grasp and apply the core concepts of analytical chemistry and aqueous chemical equilibria. Moreover, the text enables readers to master common instrumental methods to perform a broad range of quantitative analyses. Author Brian Tissue has written and structured the text so that readers progressively build their knowledge, beginning with the most fundamental concepts and then continually applying these concepts as they advance to more sophisticated theories and applications. Basics of Analytical Chemistry and Chemical Equilibria is written for undergraduate students who have completed a basic course in general chemistry. In addition to chemistry students, this text provides an essential foundation in analytical chemistry needed by students and practitioners in biochemistry, environmental science, chemical engineering, materials science, nutrition, agriculture, and the life sciences. BRIAN M. TISSUE, PhD, is Associate Professor of Chemistry at Virginia Tech, where he teaches analytical chemistry at both the undergraduate and graduate levels. In addition to curriculum development, Dr. Tissue oversees a research program in nanomaterials and analytical spectroscopy, preparing and testing nanocomposites for catalytic activity. Among his honors, Dr. Tissue has received an NSF Career Award and a Cottrell Scholar Award from the Research Corporation for Science Advancement.